2 large ripe bananas, peeled and roughly mashed with the back of a fork. Preheat the oven to 200 C / 180 fan / Gas mark 4 and line a muffin tin with 10 cases. In a large bowl mix together the peanut butter, olive oil, honey and brown sugar. When the mixture is smooth beat in the egg, milk, and vanilla. Fold in the flour, salt, allspice, and baking powder until just combined. Do not over mix the flour. Stir in the mashed banana and walnuts to evenly distribute through the batter. Equally divide the batter into 10 muffin cases, lightly sprinkle with nutmeg, then pop into the oven. Bake for around 22 minutes, until the skewer test is clean. 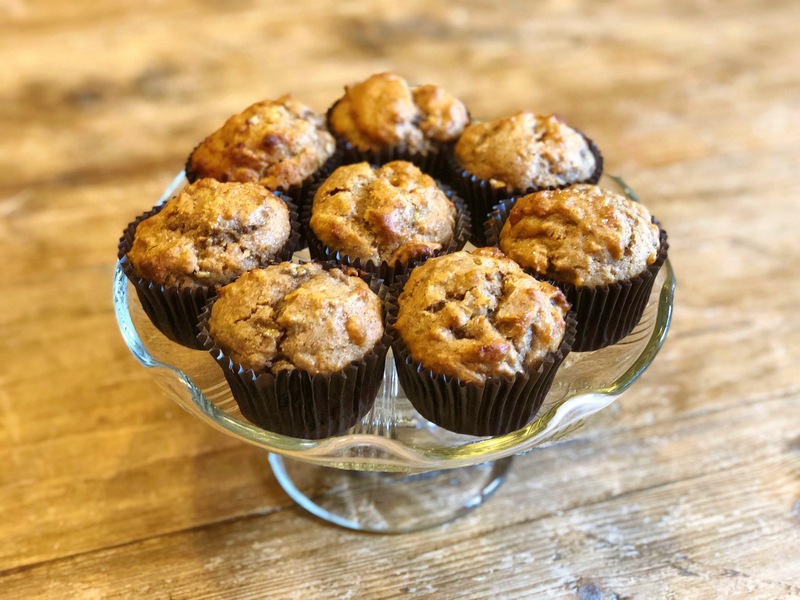 These sweet and sticky Peanut Butter and Banana Muffins are packed with goodness to leave you feeling satisfied and guilt free!